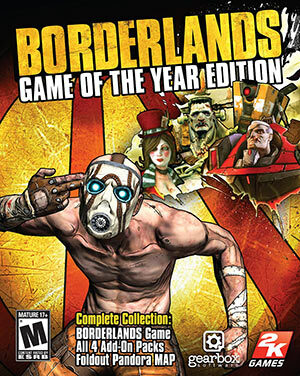 Roland is one of the Player Characters from the first Borderlands video game. If you’re not familiar with this setting, you should first read our profile for his colleague Lilith. It has everything you need. 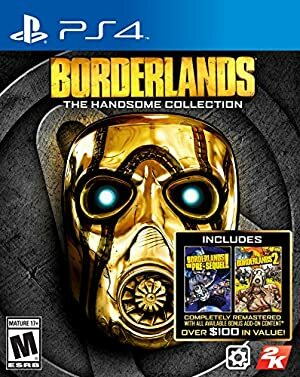 This profile only covers the first game in the Borderlands series and the material from the Borderlands: Origins comics. Real Name: Sgt. Roland (last name unrevealed). Group Affiliation: Former member of the Crimson Lance’s 114th Bouncer Division. Roland is a hardened, veteran soldier and NCO. 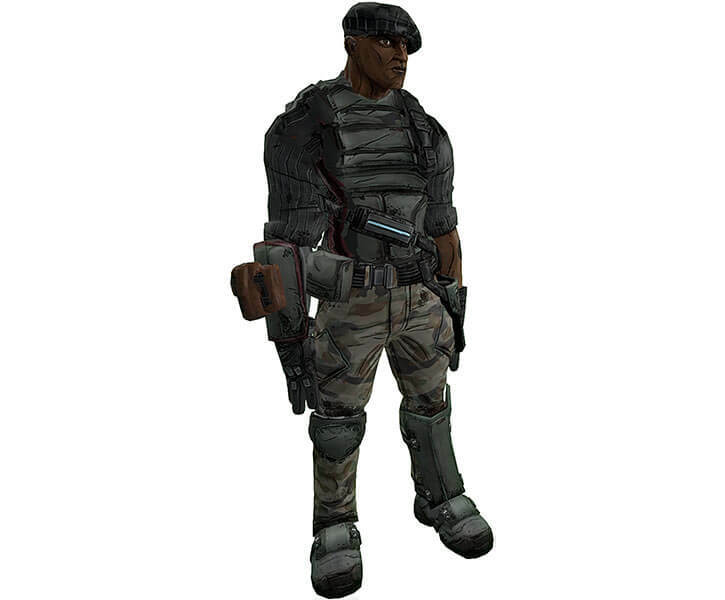 Our game stats represent a build where the character is a close-quarter battle specialist, primarily working with a combat shotgun and grenades. Roland pack weapons that use Eridian projectile charge technology. In this build, he strongly prefers lightning. 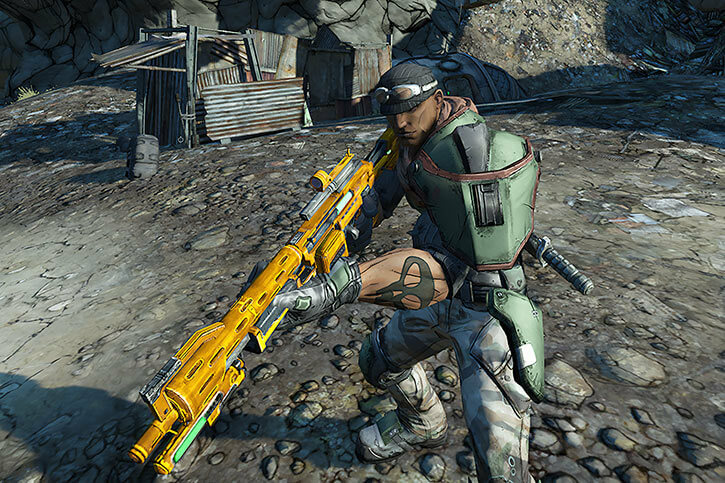 With Eridian tech, both grenade shrapnel and shotgun buckshot will release a belief-defying quantity of electricity upon impact. Roland also carries a Scorpio turret. At first sight, it could be assumed to be an entrenching tool carried on his back webbing. But it can be quickly be thrown to the ground where it will deploy as a tripod-mounted squad automatic weapon with two “wings” of force. These force structures are a sort of gun shield. Two nearby infantrymen could use these as cover (one on each side of the turret). The turret fires quite accurately. It has been likened by Roland to having another soldier pop up on the battlefield whenever needed. 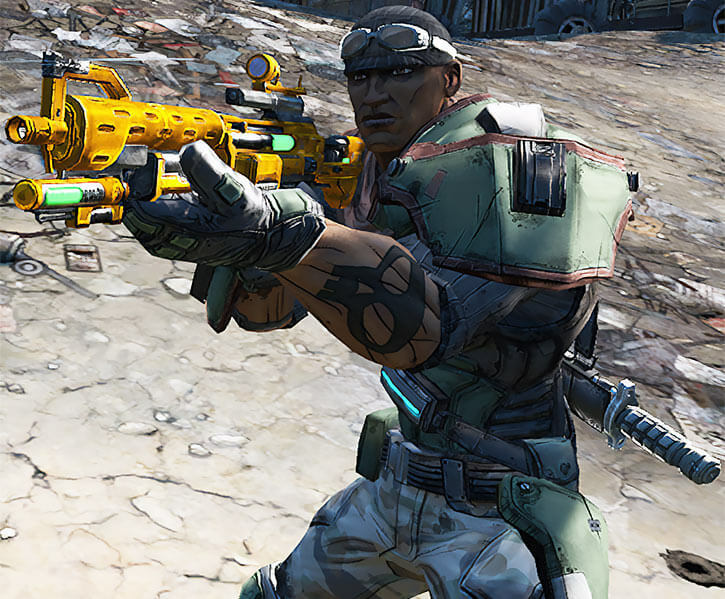 Though Scorpio turrets are usually defensive, Roland is more of an assault guy. He usually deploys the turret where it has a good fire corridor then immediately proceeds to flank whichever opponents are now focusing on his deployable robo-buddy. Alternatively, he can leverage the Scorpio’s suppression fire. A Scorpio is resilient, and can easily be picked up and folded back into carry configuration by its assigned operator. It’s great when Roland is outnumbered. Roland used to work for the Atlas Corporation, by far the largest company in the known universe. Atlas made much of its fortune by discovering technological relics from a seemingly extinct alien race. This allowed the corporation to release new products well in advance of the human technological curve. Roland was specifically a Sergeant among the Crimson Lance, Atlas’ dreaded military arm. Roland was admired by the troops for his exploits in the field. He had extensive low-level contacts allowing him to massage regulations into being more accommodating. For instance, pre-existing disciplinary demerits for soldiers he liked working with tended to disappear. However, while garrisoned on the planet Pandora, Roland stumbled upon a problem. He discovered that the junior executive overseeing his unit, one Higgins, had been embezzling money from Atlas. Furthermore, Higgins was planning to frame Roland and his squad for the thefts. Roland didn’t have contacts that were highly-placed enough to report to. Beside, Higgins quickly discovered that the sergeant knew something. He ordered Roland and his three soldiers to go patrol a crater, then laid an ambush for them, taking some Crimson Lance soldiers along with him. Though Roland’s soldiers were murdered in Higgins’ ambush, the heroic sergeant somehow survived.He then apparently killed Higgins to avenge his squaddies. Forced to desert, Roland was stuck on Pandora. Though the planet was practically lawless and with little corporate presence, the Crimson Lance still controlled the key installations. 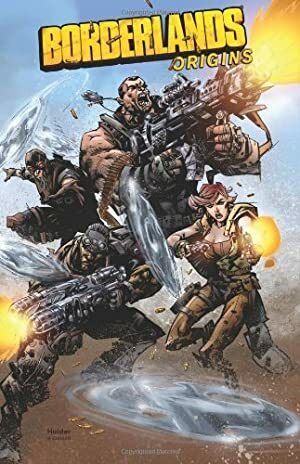 The planetary commander, a renegade Siren named Commandant Steele, strongly suspected that an alien vault similar to the one Atlas had found decades before was on Pandora. She thus maintained an active presence. As he was laying low in the Pandora wasteland, Roland received an encrypted message about the alien vault. It had been sent by an anonymous woman with some odd physical similarities with Commandant Steele. Roland seems to be dour and task-oriented, preferring to focus on his immediate responsibilities and speak in short sentences. His squaddies liked him and saw him as a sort of do-gooder and super-hero. They liked making up impossible exploits for their sarge to have accomplished. A typical example would be putting down an insurrection by himself and while only armed with a taco wrapper. He’s career military all the way, which is obvious in his diction and demeanour. He’s been military for so long that he has forgotten how to interact with people outside of this specific context. Thus he’s always about missions, objectives, order and leadership. He doesn’t bother with small talks and niceties unless he’s clearly between missions and waiting for new orders. He’s also bad at nuanced interaction. His relationship with Lilith was super-awkward as both lacked the necessary people skills to be a couple. Roland is reasonably ethical. He has absolutely no problem with killing, likes fighting, and will do things like sacrificing his troops if it is necessary. *But* he’s not a sociopathic rucksack of dicks. That, by Pandoran standards, makes him a shining white knight and paragon of virtue. Roland reportedly loves Christmas time. Credentials (Free access to the Catch-A-Ride network), Familiarity (Military equipment and protocols), Lightning Reflexes, Pet (Scorpio turret), Schtick (Shotgun Man). 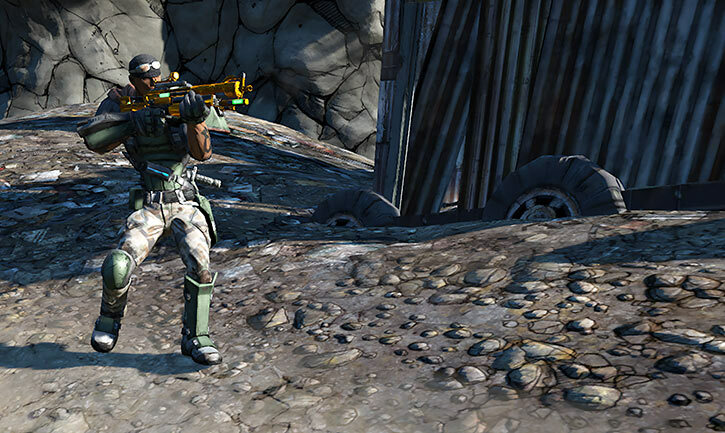 The original Vault Hunters (Low). 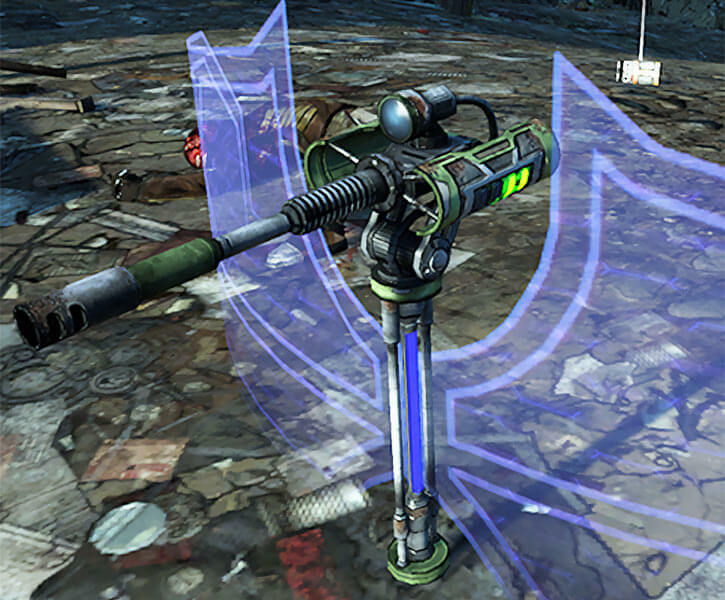 Scorpio turret [BODY 07 INT 03, Projectile Weapon: 07, Force shield: 03, Weaponry (Self): 07. 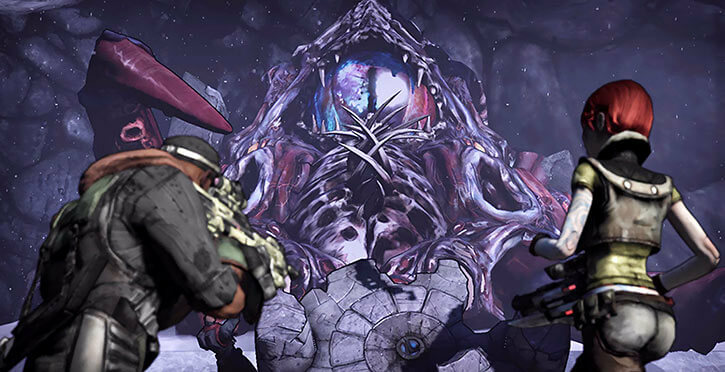 Note that the Scorpio can’t move around – no DEX. 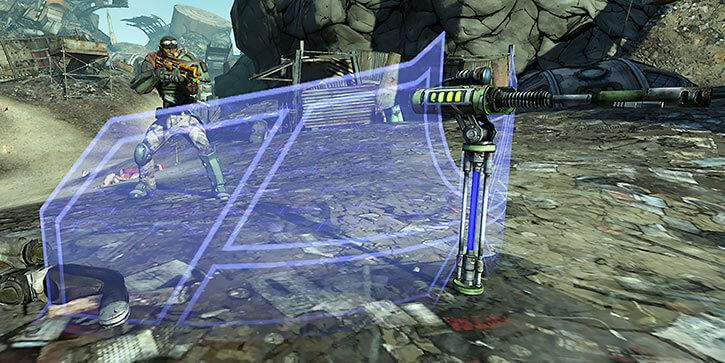 The Force Shield is applied to anybody taking cover behind the “wings”, though a Trick Shot can bypass it.]. BODY ARMOUR [BODY 06, Skin armour: 02, Shade: 02, Drawback: Real Armour]. ORB SHIELD [BODY 02, Blunting: 12, Damage capacity: 12, Regeneration: 02, Skin Armour: 03, Advantage: Damage Capacity regains one AP of Current Condition at the end of every Phase where Roland has not been hit by an attack, Limitation: Skin armour only vs. fall damage]. Large combat knife [BODY 05, Enhance (EV): 01 (Cap is 06), Descriptor: Piercing, Slashing]. Matador-class shotgun w/lightning shot [BODY 04, Shotgun blast (Range 02): 07, Lightning: 05, Ammo: 06, Bonus: Shotgun Blast and Lightning are Combined, Lightning has No Range but rides Shotgun Blast’s Range]. Scoped battle rifle [BODY 03, Projectile weapons: 06, Telescopic vision: 01, Ammo: 04]. Bouncing Betty shock grenades [BODY 01, Lightning (2 APs Area of Effect): 08, Ammo: 09]. Another shotgun with another element (probably incendiary or corrosive) and perhaps a spare sniper rifle just in case. 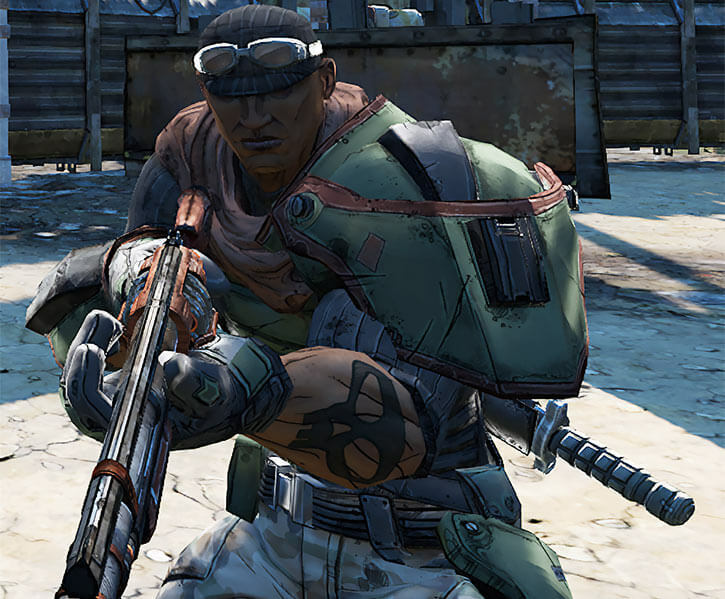 In BL2, Roland has High Credentials with the Crimson Raiders, and his Connection with Lilith is probably High. He also presumably has higher stats and better guns. See the second Lilith entry for a sense of progression between early and late stats. 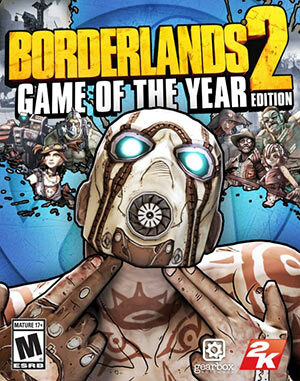 Source of Character: Borderlands – this entry only covers the first game in the series. Roland voiced by Oliver Tull. Writeup completed on the 5th of August, 2014.